HOOVER, Ala. — LSU manager Paul Mainieri thought Jake Slaughter had just put the Tigers ahead. The sophomore third baseman laced a ball down the third base line in the bottom of the eighth with two outs and two runners in scoring position in a 4-3 game. The SEC Player of the Year had other plans. Running on pure instinct and reactions India took one step and dove to his right, the ball taking a quick skip into his glove India got up and fired a frozen rope across the diamond to get Slaughter and keep the Gators lead at 4-3, holding on to the win in a rematch of the College World Series Final. After the game India, humbly, downplayed the effort. 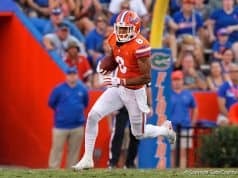 The play was a bright spot on an otherwise dreadful defensive game for the Gators. 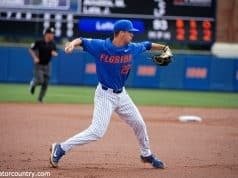 Second baseman Blake Reese made two throwing errors in the first two innings and was pulled before Florida came back out to the field in the third. LSU was able to capitalize on both of Reese’s errors. Reese’s fielded a ground ball from Beau Jordan in the top of the second but his throw made Brady Smith come off the bag. Mace hung a 0-1 curveball to Slaughter and the third baseman deposited it over the left field wall to give LSU a 2-0 lead. In the third Reese completely airmailed a throw to first after ranging to his left to allow Antoine Duplantis to reach base. Duplantis stole second, advanced to third on a ground out and scored on a single. Mace had given up three runs, just one earned, on only two hits but wouldn’t blame the guys behind him. Florida cut back into the lead in its half of the third. Nick Horvath singled up the middle and freshman catcher Cal Greenfield walked. Deacon Liput drove a fastball in the left center gap to plate Horvath and set up his team with two runners in scoring position. Greenfield would score on a Nelson Maldonado ground out to second and India drove Liput home with a single of his own to tie the game. Mace settled in and didn’t allow another hit until the seventh inning, throwing up zero after zero in his second consecutive great start. 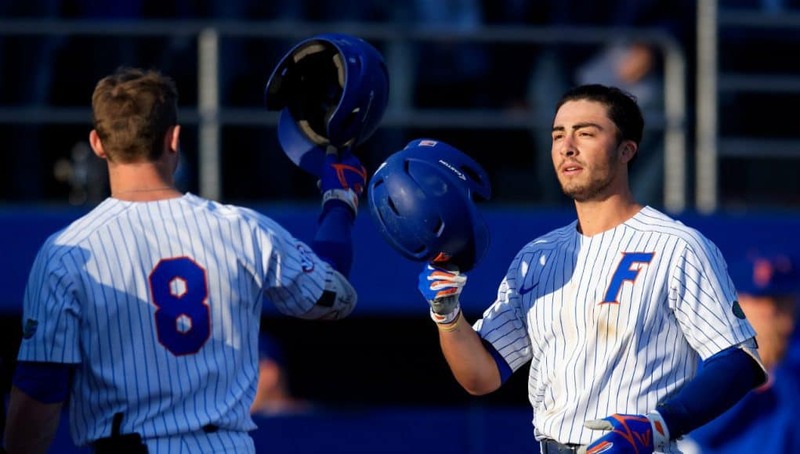 Florida took the lead in the fifth inning when Austin Langworthy’s two-out single scored India and Florida would hold on in the eighth, thanks’ to India’s golden glove at third, and a bounce back performance from Michael Byrne. 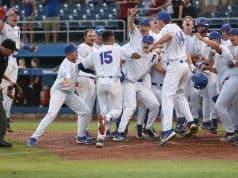 The Gators will play the winner of South Carolina and Arkansas on Wednesday night. It will be the last of the four games tomorrow, so expect a late night at the Met.